Careers Contact us | INFOMAN is Hiring! The CITY GOVERNMENT OF TAGUM awarded to INFOMAN through a public bidding process, a P14-Million project for the supply, delivery and installation of LGU Software and Hardware Systems. 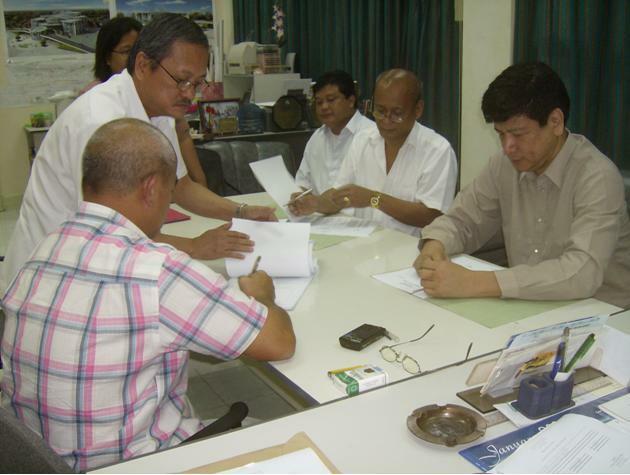 Signing the MOA in a simple ceremony last January 28, 2008 are Honorable Mayor Rey T. Uy (seated left), Tagum City, Davao del Norte and Danilo A. Yao (seated right), President, Information Managers, Inc. Also in photo witnessing the contract signing is Edgar de Guzman (seated second from right), Tagum City Treasurer.